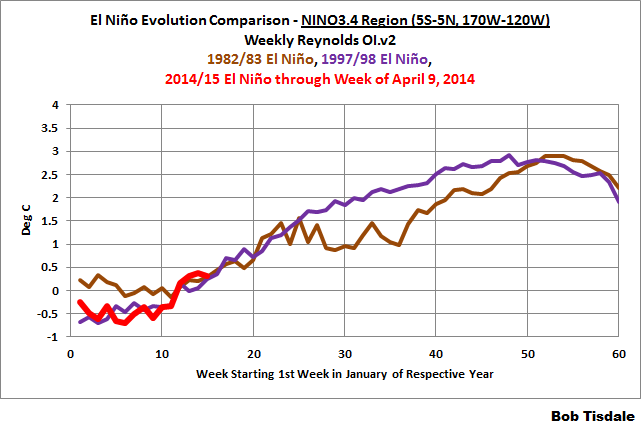 2014/15 El Niño – Part 3 – Early Evolution – Comparison with 1982/83 & 1997/98 El Niño Events | Watts Up With That? First, the NINO3.4 region, see Figure 1. The NINO3.4 region is bordered by the coordinates of 5S-5N, 170W-120W. See the illustration here for the location. It captures the sea surface temperature anomalies of the east-central equatorial Pacific. Sea surface temperature anomalies of the NINO3.4 region are a commonly used index for the strength, timing and duration of El Niño and La Niña events. And as you can see, the weekly NINO3.4 sea surface temperature anomalies still have not reached the +0.5 deg C threshold of El Niño conditions. It’s still a little early. They are presently at +0.31 Deg C compared to the reference years of 1971-2000. Sea surface temperature anomalies in the NINO3.4 region are evolving about the same as they did for the 1982/83 and 1997/98 El Niños. 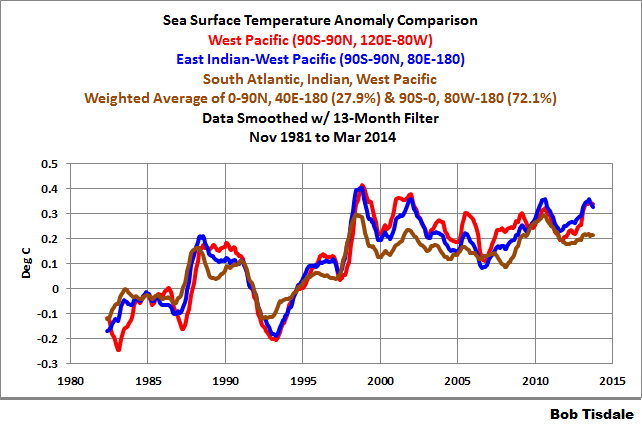 Sea surface temperature anomalies of the NINO3.4 region really don’t do justice to the 1997/98 El Niño. That El Niño was freakish in how quickly it evolved in the eastern (not central) equatorial Pacific and how warm the sea surface temperatures eventually grew there. We can use the sea surface temperature anomalies of the NINO1+2 region to illustrate this. See Figure 2. The NINO1+2 region is bordered by the coordinates of 10S-0, 90W-80W. It’s just west and south of the Galapagos Islands. The sea surface temperature anomalies in the eastern equatorial Pacific are evolving this year more like the 1982/83 El Niño. The NINO1+2 data for 1997 shows east Pacific sea surface temperatures warmed much sooner during the 1997/98 El Niño. The 1982/83 El Niño was strong, there’s no doubt about that, but it was nowhere close to being comparable to the 1997/98 El Niño as an east Pacific event. A couple of things to keep in mind: First, there are subtle differences between El Niño events. It’s still very early in the evolution this year to make predictions of how strong the 2014/15 El Niño will eventually become. Second, before you look at global surface temperature data and conclude that the 1982/83 El Niño had a very small effect on global surface temperatures, compared to the 1997/98 El Niño, keep in mind that the 1982/83 El Niño was counteracted by the eruption of El Chichon that year and there was no colossal explosive volcano in 1997 to offset the 1997/98 El Nino. My ebook Who Turned on the Heat? goes into much more detail to explain El Niño and La Niña processes and the long-term aftereffects of strong El Niño events. I’ve lowered the price of Who Turned on the Heat? from U.S.$8.00 to U.S.$5.00…with hope of increasing sales a little bit. A free preview in pdf format is here. The preview includes the Table of Contents, the Introduction, the first half of section 1 (which was provided complete in the post here), a discussion of the cover, and the Closing. Take a run through the Table of Contents. It is a very-detailed and well-illustrated book—using data from the real world, not models of a virtual world. Who Turned on the Heat? is only available in pdf format…and will only be available in that format. Click here to purchase a copy. Thanks. April 14, 2014 in El Nino Basics, ENSO. Perhaps you can also include a graph on number of “the sky is falling” articles on the three El Nino events. Seriously, thanks for just posting the facts and letting us figure it out. You and the other authors here are the best. Hey Bob, there has been excitement over the past couple of years about an El Nino forming, is this years trend so far any stronger evidence than previous? So you are predicting that, without any doubt at all, there will be an El Nino this year. I know virtually nothing about the subject, but I still have doubts that an El Nino will, in fact, form in 2014. Since the Eastern Pacific sits on the “ring of fire” has anyone ever made a study of subsurface volcanoes and El Nino formation. IMHO the only thing that would cause an “early” temperature development would be SSV activity. 13April: The Economist Blog: Babbage: Rebels without a cause? The implications of the study are more troubling than even pencils acting aggressively. Region 1+2 is small compared to the other regions. How important is it? Excellent article as always. I do have a question that others have asked as well: why are you convinced that an El Nino is actually forming at this early point? Since it looks like there will be an El Nino, as predicted…I’m curious if there have been any predictions about a Nina forming. Bob, since you and other specialists are expecting an El Niño, I accept that one is likely. However, I have been watching global wind patterns here–http://earth.nullschool.net/#current/wind/surface/level/orthographic=-146.90,-0.83,289–and continue to see the trade winds as predominately easterly. 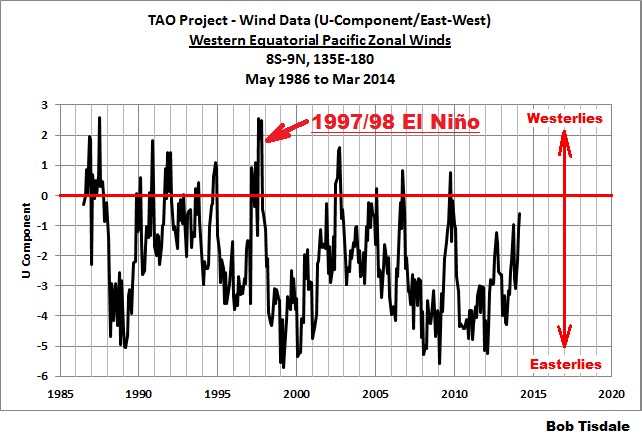 In your essays on El Niño you repeatedly cite a weakening of the trade winds as one of the conditions for an El Niño. Are the current trades much weaker than normal, or are there additional conditions that can lead to an El Niño? I believe you have said that a considerable quantity of warm water has already moved eastward from the Pacific Warm Pool. Any clarification would be greatly appreciated. I took the hint and just bought Bob’s book. I see it is 550+ pages, so I know where my spare time it going for the next week or so! But I have often wished I better understood the subject, so I look forward to the education. The 98 super El Nino followed on the heels of a record “Haze” in SE Asia, largely a result of seasonal land clearing and local wind patterns. Coincidence? I’d bet my house we don’t get a super el nino. (hey, it’s a small house). Actually, I’d prefer a 97-98 variety. Weak el nino in context of cold pdo spells another nasty winter for U.S.. Also, not worried about wrecking the pause if we do get a major el nino. It might break the trend for a year or two, but the alarmists who to a man are salivating to be proven right that we’re all going to fry, forget what happens after a spike up…which is a spike down. Q, Do you feel Recent Solar TSI spike since Oct had anything to do with the Spike in the PDO. PDO seemed to move closely with TSI over last 15 months. I charted TSI and PDO over the last 15 months. This year is not unusual for a strong El Nino. I’ll compare this one to the lesser El Ninos later in the week. I am sure the warmist alarmists are ringing their hands hoping for a super El Nino to come in 2014-15 to break the 17-year pause, which is really not a pause at all, even though it needs some breaking. Their inner thoughts would praise mother nature for coming through for them, but their lips will will parrot something quite different. It will either be drawn to the surface, which is what appears to be happening, or it will be recirculated. It’s not going to disappear. njsnowfan, sorry. I don’t really study the PDO for 2 reasons. (1) The PDO is not sea surface temperature data (it’s derived from sea surface temperature data) and (2) the PDO is an aftereffect of ENSO. I also put this together ENSO and solar. From the looks of things with past El Ninos and solar this time solar in not strong enough to make a supper El Nino this time. I’ve seen discussions of it, but I’ve never seen anything worthwhile, because the warm water for the El Nino comes from the western tropical Pacific, not the eastern. Like the NINO3.4 region, the NINO1+2 region provides us an indication of the strength of an El Nino, but on a different portion of the equatorial Pacific. The 1997/98 El Nino was especially strong in both the central and eastern portions of the equatorial Pacific. Bob of I get time tonight I will put TSI and ENSO chart. Just curious if there is a match with Solar TSI spikes. As of last month, no. But it’s still a little early. Note that the westerly wind busts don’t show up well in the monthly data. We’ve had two already and I’ve heard reports of a possible third one brewing. And thanks for linking the earth.nullschool.net animation. I hope to use them as the El Nino progresses…and to go back a few months in those maps to show what the westerly wind burst looked like. Bob Tisdale with only two charts? If there is a strong El Nino this year, we should expect a La Nina for 2015/16. Gotta go. Be back later this afternoon. How many years does it take for the residual warmth of an El Nino event to be dissipated to the point where it has no more appreciable direct effect on global temperatures? Off topic, sorry about that, Reddit AMA from Stephen Lewandowsky. In regard to Professors like Judith Curry and Richard Lindzen. They both have very impressive paperwork behind them. Are these people, and others (Like Richard Tol) be ignored? Is there some problem with their publications that I should not read/listen to them? I want to draw attention to the fact that in 1982/83 there was a terrible drought in Southern Africa which may have been caused by a coincidence of the dry peak of the 19 year drought cycle (Metonic, lunar) with a strong El Nino. It happens that at this moment the peak of the wet end of that 19 year cycle has just passed. If there was a strong double-whammy caused by the coincidence in 1983, then perhaps the fact they are almost directly out of synch this time will moderate the effect in the sub-continent. My question is about the effect of lunar cycles on ENSO events. Is there a visible periodicity that includes the moon’s position above the equator or a combination with tides? The effect of the cycle on ‘weather’ on the sub-continent is pronounced, with the ENSO features riding on top. In some of the region a huge tropical cyclone (Demoina) flooded parts of the drought-stricken area, which means that total rainfall per se is not necessarily the best indicator of drought being in progress. Just a quick chart, TSI and ENSO.. There are extensive posts on this matter on weatherbell.com. We have a blend of 57-58,02-03,09-10 and 65-66 starting to get in there. Please understand the SOI tracking is no where near this. Its getting exhausting trying to point out that this appears to be a typical cold enso reaction, when the enso is cold overall the previous 3-5 years, a nino response occurs with a rapid rise up then collapse. Perhaps this will be different, but please go the mei site and look at the mei before the super ninos and the ones we have and I think you will have your answer. Sorry.. by “this” I meant 97/82 monster falls. in fact April may actually be a rise off the March value since there is a big easterly burst occurring now! Bob liveblogs El Nino. And now, a word from our sponsor. Thanks Bob! Much appreciated, level-headed update on ENSO, especially given all the . Your “HOWEVER – Sea surface temperature anomalies of the NINO3.4 region really don’t do justice to the 1997/98 El Niño. That El Niño was freakish in how quickly it evolved in the eastern (not central) equatorial Pacific and how warm the sea surface temperatures eventually grew there.” statement is key to this current ENSO event and its future development. The RT-cycle analysis finds ONI to turn + during either the MAM or AMJ seasons, and the el nino to peak during either the 2014 OND or NDJ season with likely a value of ~1.6 +/- 0.2. What a creepy blog and group of posts. The good side is we can see how this one develops and then add the information to our knowledge. The bad side of course is how the alarmists will use it for PR value. James Strong asks ‘Are the current trades much weaker than normal’ and mentions the oft quoted theme that this is a required condition for an El Nino. James, good for you for monitoring the wind direction and discovered the predominant easterly flow.and I wish more would do so. My two cents worth here regarding a pre condition for a weaker flow come from simple empirical observations by satellite and met offices throughout the SW Pacific: The El Nino cycle partially defined by Nino 3.4, and SOI seems to be coincident with lighter trade winds. This is not 100% by any means. I forecast this area and that to the west and can assure you that ‘light trades’ and ‘strong trades’ occur whether the cycle is La Nina or El Nino or Neutral. The wind speed varies constantly regardless of which ENSO cycle we are in. In the summer and fall southern hemisphere time frame we see westerly pulses due to the Australian Monsoon , the MJO, strong High pressure cells in the northern hemisphere pushing flow across the equator and turning to a westerly quadrant, and most important the location and strength of the South Pacific travelling High Pressure cells. If the central pressure of these cells is over 1030 hPa we will see 30 knots or more E to SE winds on the perimeter and conversely if the Highs are weak so are the trades. The Nino 3.4 region winds in the southern hemisphere come mainly from the semi permanent High off of South America. If that High is weak, so are the trades and conversely if it’s strong. The travelling Highs I mentioned before do play a role here; they don’t just disappear when they near South America, they become absorbed into the semi permanent High so with some imagination you can see how the semi permanent High’s central pressure fluctuates and thus its output in the form of easterly trades. There are so many intertwined events that blanket statements just can’t be done. If all of us do what James does and monitor the flow it will take the mystery out of the equation and help make ENSO more understandable. And a final note to Bob T; just bought your book and good on you for a great job. Says the opposite of what you intended, namely “bursts”, as used in the last line. Thanks Bob. Figure 2 is especially enlightening. herkimer says:	“Any reason why you are not using ONI INDEX…? So ONI data are useless in comparisons. Trenberth even opted to use the older version of the ONI data in a recent paper, though I can’t recall which Trenberth paper that was at the moment. Looking at the West Pacific (90S-90N, 120E-180), or the East Indian-West Pacific (90S-90N, 80E-180), or the South Atlantic-Indian-West Pacific (90S-90N, 80W-180) sea surface temperature anomalies, there has not been sufficient time between the strong El Nino events to determine that. Sorry. I’ve never studied the subject. Once again, please provide a link to Joe D’Aleo’s work on the subject. You keep mentioning it but so far you haven’t provided a link. Maybe that’s what I need, sponsors. Because people are comparing this year to the 1997/98 El Nino. 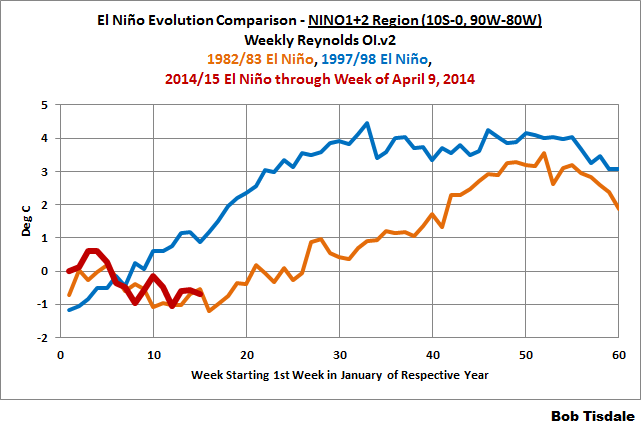 The next post will compare the evolution of this El Nino to the other ones. I didn’t have the time this morning to graph all the other ones during the satellite era. You can get the Pacific equatorial cross-sections on a monthly basis back to 1979 here. Compared to right now which is pretty close in my opinion. The surface temps in May 1997 were actually quite a bit cooler than they are right now although the second biggest Super-El Nino in history was lurking right below the surface, and would peak just 7 months after this surface temp map. It almost seems to me that an El Nino event, is a way the heat from the ocean is belched into the atmosphere on the way back to Space. The heated ocean water cools, giving up the heat to the atmosphere, the atmosphere can’t hold the heat for more than a year or so, as its GHG blanket is woven with the comparable material as women’s fishnet stockings, Ceres and Erbe confirm the heat gets out; and then the result is both the Oceans and Atmosphere cool. All in all, a negative energy feedback. It seems to me the standard view of El Niño is becoming questionable. It appears the warm water beneath the surface is driven eastward by a Kelvin wave and this is what initiates the process. This warm water then surfaces which changes the pressure difference between the East/Central and West Pacific. The trade winds then slacken due to the change in pressure. If this is indeed the case, what is it that drives these warm waves? This would be the cause of the El Niño. Off topic, sorry about that, Reddit AMA from Stephen Lewandowsky…. This comment is a real corker! I think it is sad that scientific research is not freely available. I share reprints with anyone who asks for them and i also believe that within the next 10 years at most, we will have converted scientific publishing to an open-access model. So we should take Lewandowsky at his word and he should be willing to give his raw data to statisticians like Steve M or W. Briggs, right, RIGHT? Bob, I really did not want to hear we are getting an El Niño just in time for mid-term elections. (I rather have a Polar Vortex) Hopefully it is weak and peaks quickly. I dunno, but the SOI is just now backing up a tad, I’m not feeling much of an El Nino. Looks more like a brief departure from an extended regime of Neutral conditions. Of course, there has to be enough warm water in the western tropical Pacific to support the Kelvin wave and, later, the El Nino. Bob T … from what I can see the warm water moves below the surface even while the trade winds are easterly. Maybe a temporary lull gets the process going? Still a little unclear to me. 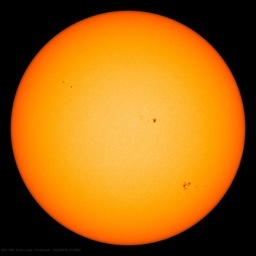 AGW activists have long stated that warming in the last three decades of the century cannot be explained by solar activity, as the peak was earlier in the century. I’ve thought that the ‘pan of water on the stove’ analogy perhaps applies, i.e. that the water continues to warm up or stay warm even though the stove has been turned down from maximum a little, but this in itself is hardly evidence. You’ve suggested through your analyses of SST that latter 20C warming occurred in a few steps, triggered by Nino events. My questions are: could these significant Nino events be considered to be a lagged response to the strong solar activity seen from 1950 onwards? If so, would you or anyone else have a handle on how big a factor this could be? How about the odds of an El Nada or La Nina? Still in the 50:50 range? Which means nobody knows nothin’?